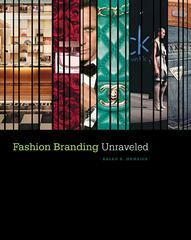 Fashion Branding Unraveled 1 Edition Fashion Branding Unraveled introduces and explains the concept of brand and the process of brand development. The book clarifies misconceptions, introduces new concepts, and proposes a step-by-step roadmap for developing an effective brand, all within the context of the fashion industry. Using an easy-to-understand approach, relevant examples, and case studies, it applies the theories and concepts covered, such as "mass customization" and "M-branding," to a variety of industry segments, from luxury brands to private labels. The book includes an examination of the latest technologies, their applications, and--most important--their effects on the future of branding.